A play area is available to help occupy waiting siblings. The play room is stocked with fun toys, books, and coloring supplies. There are chairs and a viewing window for parents to watch their children in gymnastics while supervising their other children in the play area. 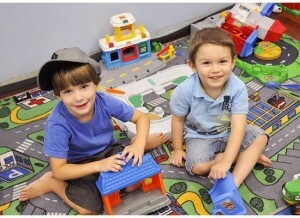 There will be a child care employee in the sibling play room during the evening classes. If you would like to drop your child off to be supervised by our child care employee while you watch classes from the parent viewing area, this service will be available for an additional $25.00 per month for first child and $10 per month for the second child who is left in the child care employees care. Parents who have not opted to utilize our child care services are still welcome to use the play area, but should remain in the play area to supervise their children.